BC’s Judicial Council has published its 2017 Annual Report, containing some surprising statistics and several “firsts”. In keeping with the BC Provincial Court’s reputation for innovation, in 2017 the Judicial Council launched the first online application system for judicial appointments in Canada. 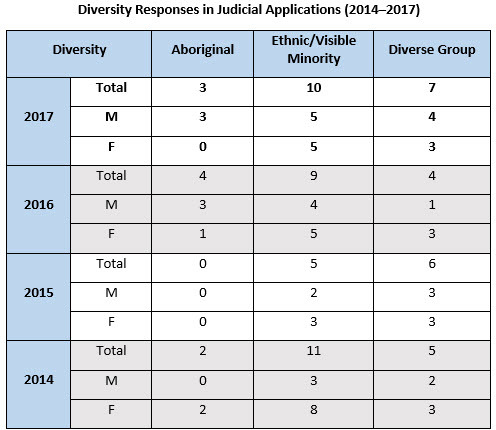 The Council, responsible for screening candidates for appointment as Provincial Court judges and judicial justices, also received its largest number of applications in the last decade, and there were milestones for women in 2017. The Provincial Court Act makes the Judicial Council responsible for screening applicants for appointment to the Provincial Court. Until September 4, 2017, applicants for appointment as a judge or judicial justice of the BC Provincial Court submitted an application form they downloaded from the Court’s website. With the launch of the Judicial Application and Reporting System on September 5, all applicants began submitting their applications electronically. A Judicial Candidate Process Summary, available online, outlines the entire process from application to appointment. This online system is the first in Canada to replace all paper forms and documents in the application process. Applicants now access the necessary forms on the Provincial Court website by clicking a link to the new system and creating a personal account. Early in 2018, the Council began using a document management component of the new system to view all applicant profiles and meeting materials online, saving trees, staff time, and the expense involved in creating paper copies of this material. When a lawyer applies to be appointed a judge, the Judicial Council begins its investigation by obtaining reports on their suitability for judicial office, including any complaints made about them to the Law Society of BC; their credit, driving, and criminal record backgrounds; and comments from judges familiar with their work. The Council reviews this information in light of published criteria and competencies, and decides whether to interview the applicant. During an interview, Council members ask questions designed to assess suitability for appointment and address any issues raised by the reports. The Council then votes on whether to recommend the candidate to the Attorney General of BC for appointment. When the need for a judge arises the Attorney General will select a candidate from those recommended and provide the name to the Lieutenant Governor in Council for appointment. •	recommended 2 retired judges for one year reappointments. The number of applications received in 2017 was significantly higher than the ten-year average of 47.3. In August 2017 there was an influx of applications, apparently by those who had begun to prepare paper applications and wanted to submit them before the online system launched. In 2017, significantly more men than women – almost twice as many - applied to be Provincial Court judges. This was a change from recent years when more women applied than men. For the first time in a decade, in 2017 female applicants averaged more experience than male applicants, and they had the same average age. The number of judges appointed in 2017 was higher than the previous year and well above the ten-year average. The Lieutenant Governor in Council appointed 14 Provincial Court Judges, five more than the ten-year average of nine. In addition, the Lieutenant Governor in Council appointed two retired judges for one year terms to meet short term needs. Although more men applied in 2017, more women were appointed. Four men and ten women were appointed as Provincial Court judges in BC. (Since the names of recommended applicants remain on the list for 3 years from the date of their interview, some of those appointed may have applied in previous years.) The two retired judges reappointed were male. 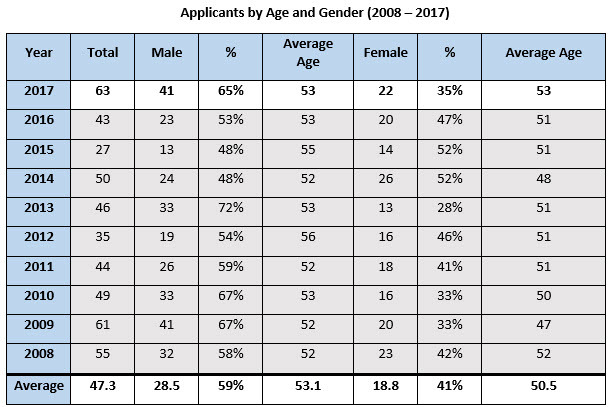 The number of female applicants appointed was well above the ten-year average of 3.9 and was the highest on record for the Provincial Court. BC’s Judicial Council recognizes the importance of having a judiciary that reflects British Columbia’s diverse population. Diversity on the bench strengthens its fairness, enhances public confidence in the administration of justice, and eliminates an implicit barrier to under-represented groups applying for judicial appointment. The Council therefore strives to encourage a wide cultural range of applicants and to make merit-based recommendations that reflect BC’s diversity. Its efforts were acknowledged when the Canadian Bar Association’s Judicial Advisory Committee recognized the BC Judicial Council’s yearly publication of statistics on applications for appointment as a model of transparency in 2013. In 2013, the Judicial Council amended its application forms to invite applicants to include, on a voluntary basis, their ethnic or cultural information. In 2014, the collection of this information began. The Judicial Council notes this information in its overall assessment of applicants but does not assign it any particular weight. Each year the Judicial Council of BC publishes its annual report on the Provincial Court website (www.provincialcourt.bc.ca) as part of its commitment to accountability, transparency and public access to information. Find more details, including more charts, in the 2017 Annual Report of the Judicial Council of British Columbia.